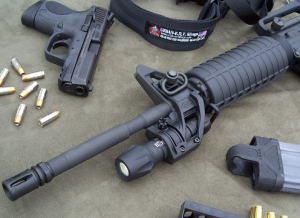 Reed and Jake shine some light on AR-15 tactical lighting options. Welcome to episode 39 of the AR15 Podcast. I’m your host Jake Challand with Co-host Reed Snyder. This is THEE podcast about youuurrrr favorite black rifle! This show is for you; whether you're building your first AR or you’ve been building AR’s for years. There’s something we can all do to take our black rifle to the next level. Training Tip of The Week: Learn your Manual of Arms. When we talk about training with the MSR platform we never mention the first and most important part of training. Know Your Weapon. Levi - I like the idea you gave the guy about buying parts kits and replacing the parts you don't want. Then when you have enough extra parts just build another. That's a great way to hide a build from the wife. Now if I could figure out a way to hide the ammo purchases to feed these beasts!!! Myles: Hello, been awhile hasn't it, anyway I am writing to try to answer a viewers question about a better muzzle device. My experience with such things is limited but I can highly recommend the Smith enterprises vortex and Yankee hill machine phantom muzzle devices. However my highest recommendation goes to the PWS triad, I had one of these things installed in a Microtech rifle and they are wonderful. They really cut down on blast and reduce recoil from an annoying little rabbit kick to a barely perceptible push. I wouldn't have thought it was possible to have a muzzle device do that many things. Here is a demo video, I wish I could have found something a little less commercial but it does demonstrate the devices capabilities fairly well. Also if one is so inclined, and is willing to tolerate such a large weight hanging off their rifle I have some friends who have had good experiences with the Noveske KX3. It reduces blast near the shooter, but acts like the loudener from the Simpsons gun shop scene to anything down range. However if something is down range you probably don\'t care much about it anyway. It's been getting stellar reviews. Same functional results as the BattleComp, with a more robust design, only slightly heavier, and at almost 1/2 the cost. Of course, the added benefit here, is that it is both a compensator to improve follow up shots and keeping your optic on target, as well as a flash-suppressor all in one. I'm glad you all like my "AR-Nerf" pic...I'll try to get more up there soon. Keep up the great podcast..it makes my commute fly by. Brian A: First, thank you for doing this podcast; I love it. Second, you all inspired me, so I bought a blemished lower from Palmetto State Armory, and am embarking on my first build. Third, I would like to be signed up for the Otis giveaway. I have an Otis cleaning kit, and have nothing but praise for their products. Richard Spackey: Hey guys, thanks for getting to my question about sighting with the Magpul MBUS sights. I do not have the cheep air soft sights as you suspected. Your first caller (from Canada, I think?) got me pointed in the right direction. I did a search on You Tube and found a USMC training video from 1999 on the proper use of this style of sights. I haven\'t been out to the range yet but I am looking forward to trying what they taught in the video. Mark D: How about a show dedicated to down and dirty basic necessity’s and additions for black rifle ownership such as slings or optics. In addition how about a detailed description of your personal rifle builds. What parts were selected and why, what worked and what didn’t. Otis BONE Tool and O12 Carbon Remover Giveaway O12 removes stubborn carbon fouling with ease BONE tool is the quick clean tool which scrapes carbon and fouling from the bolt, bolt carrier, and firing pin of your AR15.